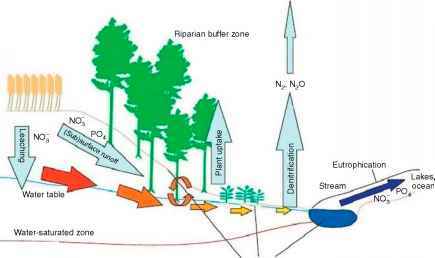 In general, disturbance, nutrient enrichment, slow recov ery rate of resident vegetation, and fragmentation of successionally advanced communities promote plant inva sions. Few alien species invade successionally advanced, undisturbed plant communities (some that do are the shade tolerant species Alliaria petiolata, Microstegium vimi neum, and Sapium sebiferum). Most alien species are excluded during the first 10 or 20 years of uninterrupted secondary succession, or over longer periods of primary successions. Plant communities in mesic environments are generally more invasible than communities in extreme terrestrial environments. Xeric environments are not favorable for germination and seedling survival of many introduced species (abiotic resistance), and wet terrestrial habitats do not provide enough resources for invaders because these are monopolized by fast growing and highly competitive resident species (biotic resistance). The wet test end of the moisture gradient, open water, is highly susceptible to invasions by alien aquatic plants. However, despite these rules, even ecosystems that have been viewed as resistant to invasion may be invaded by species that fit the combination of biotic and environmental con ditions (as documented by recent invasions of Brassica tournefortii, Eragrostis species, and Pennisetum ciliare in the Mojave and Sonoran deserts). Variations in the extent of invasion among recipient communities are partly due to differences in the number of aliens arriving in the community. Intrinsic invasibility can only be determined if processes of immigration and extinction are taken into account. The number of alien species in a region (community and habitat) is the product of the number of alien species introduced S, and their survival rate I in the new environment. The number of introduced species can be broken down into accidental and intentional introductions, and survival rate into losses attri butable to competition, herbivory, chance, pathogens, and maladaptations associated with release of a species into unsuitable environment. 'More invaded' does not necessa rily mean 'more invasible,' and real differences in invasibility must be assessed by analyzing residuals from the relationship between invasion success and propagule pressure, which determines S the above equation. For a simple number ofinvasive species the community harbors, the term 'level of invasion' is more appropriate (Figure 2). 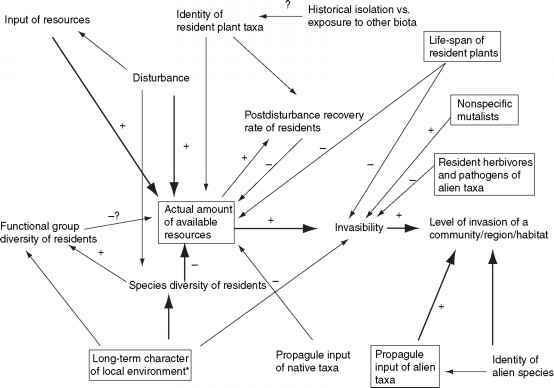 Figure 2 Causal relationships between factors and processes which determine invasions of alien species into plant communities. Only positive or negative effects are indicated; if no symbol is associated with an arrow, the effect can be negative or positive, depending on situation. Thick arrows indicate the principal factors. * spatial heterogeneity, (micro) climate, and long-term regime of available resources and toxic compounds. The key components are in boxes. Adapted from Rejmanek M, Richardson DM and Pyssek P (2005) Plant invasions and invasibility of plant communities. In Van der Maarel E (ed.) Vegetation Ecology, pp. 332-355. Oxford: Blackwell Publishing.